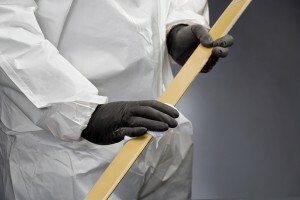 GKC (Kevlar) Bows | Niagara Composites International Inc. Introduced by NCII to the wire industry in 1989, Kevlar is the perfect choice for tough wear and tear installations. It is used primarily in machines operating in the 1500 to 3000 RPM range, but also works well at lower speeds. 57,300 tensile pounds per square inch. Why Carbon Fiber or GKC Bows rather than Steel Bows? Carbon fiber and GKC bows have a higher tensile strength than steel by weight. They are up to five times stronger. The lighter weight means less frequent bearing replacement, faster and more energy efficient operation, and associated cost savings. When steel bows break during operation, it is not just the bow that can be damaged. The break can also harm the spool and its wire, other machine parts, and even the operator. Labor costs for broken steel bow removal are higher, because they are harder to remove when wrapped around other machine parts. Plastic bows return to their original shape when bent, minimizing the need for replacement. This is not the case for steel bows. It is also easier and less costly to clean up broken plastic bows. Downtime of one hour, two hours or even a day will result in decreased productivity. This is often overlooked as a production cost.